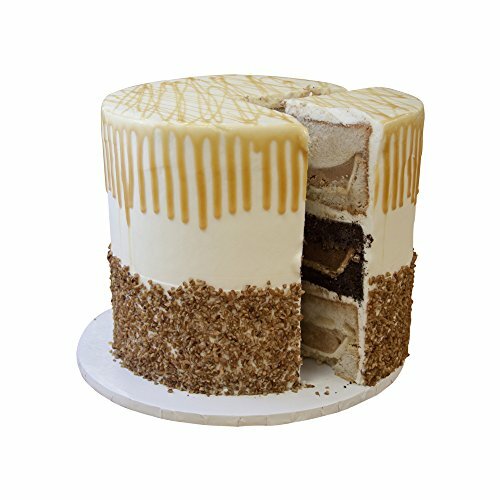 Pumpkin pie baked in spice cake, pecan pie baked in chocolate cake, apple pie baked in spice cake, cream cheese icing and filling, trimmed with nuts and topped with a generous caramel drizzle. Made in Texas in a scratch bakery. Three Brothers Bakery is a facility using nuts, milk, soy and wheat, so cross contamination can occur. If you have any questions about this product by Three Brothers Bakery, contact us by completing and submitting the form below. If you are looking for a specif part number, please include it with your message.